An Emperor penguin nicknamed 'Happy Feet' waits in its crate on the New Zealand research ship Tangaroa moments before its release in the Southern Ocean near Campbell Island, New Zealand September 4, 2011. Scientists tracking Happy Feet, the wayward penguin who became a worldwide celebrity after washing up on a New Zealand beach, said Monday they had lost contact with the giant bird. Researchers said they had received no transmissions since last Friday from a satellite tracking device that was attached to the penguin after he was released into the icy Southern Ocean on September 4. Happy Feet may have been eaten by predators, or the tracking transmitter may have failed or fallen off as the penguin swam in the sub-Antarctic waters where a New Zealand research vessel dropped him off, researchers said. Colin Miskelly, an animal expert from Wellington's Te Papa museum who advised on Happy Feet's two-month rehabilitation when he was found emaciated and near death in late June, said efforts would continue to relocate the bird. "It is unlikely that we will ever know what caused the transmissions to cease, but it is time to harden up to the reality that the penguin has returned to the anonymity from which he emerged," he said. 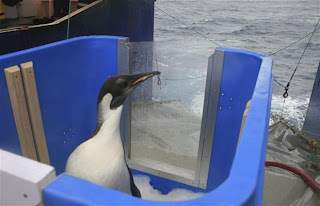 Happy Feet, was released into the water from the New Zealand fisheries vessel Tangaroa near Campbell Island, about 700 kilometres (435 miles) south of New Zealand's South Island. The three-and-a-half year old male's home in Antarctica was about 2,000 kilometres further south and the hope was that he would join up with other emperor penguins on the long voyage. Miskelly said in his blog about the bird at www.tepapa.govt.nz that he had not given up hope of a happy ending for Happy Feet. "Maybe, just maybe, he will surprise us all by turning up at a monitored emperor penguin colony, where the transponder inserted under the skin on his thigh will remind us all that once upon a time, a long time ago, he was more than just another penguin," he said. Happy Feet was only the second emperor penguin ever recorded in New Zealand. He was close to death and needed surgery to remove sand and sticks from his stomach before he could be fattened up at Wellington Zoo on a diet of fish milkshakes, attracting international attention during his New Zealand sojourn. Attendance at the zoo almost doubled during his stay and there are plans for a book and documentary recounting his story.